Lake Placid presents its own set of challenges with a relatively crowded swim, a long run to T1, a very challenging bike course, and a run that would be a tough marathon even if you were fresh, never mind after 180km of cycling. For those planning to race IMLP in 2013, there are about 8 weeks to go. At this point, you should have a good understanding of the unique demands of the race so that you can train specifically as well as develop a race day strategy to nail this popular Ironman. From my own experience racing IMLP, that of my athletes and some past age grouper files, here’s what you’ll need in your arsenal on July 28. In order to improve your swim time, focus on longer sets at a steady pace in your training. If open water swims are not possible where you live, then swimming 5-7×600 repeats at a consistent pace would help. Remember, you don’t have to start out super fast since you won’t have to deal with the mass start. This should help you save some heart beats for the bike and run. The run to T1 is about 800m, barefoot, on the sidewalk, so be prepared for that. How? Practice running barefoot a bit just to get your feet familiar with the pounding your soles will take. This two-lap course is very scenic, but you’re not here to smell the roses; you want to get from the town of Lake Placid and back as fast as you can, and do it as efficiently the second time as you did the first. Expect wind on the second lap and for the long, 11-mile climb back to be a bit tougher the second time around. For your Training Stress Score® (TSS®) points, the magic number to aim for is typically 300 when you ride around 5:15-6:00 hours. Once you are above that, you are looking at a 15-25% increase in TSS points. The closer you ride to 300, the better your run will be. From looking at the files shared with us from age groupers who have done IMLPs past, we see some serious TSS points and the run times reflect the length and stress of the TSS. A 7:22 ride (450 TSS points) by Alexandre Desemery last year netted a 5:11 run; and a 6:12 ride by Trabbatoni (496 TSS points) netted a 4:38 run. That’s a lot of energy to give up to the course prior to running the marathon. Whereas, I’ve seen rides close to 6 hours, with low TSS of 250s and a 3:50-ish run. The other consideration is that the harder you ride, the more energy (kilojoules) you’ll be burning up per hour. The riders who are close to 5.5 to 6 hours are burning around 650-700 KJs an hour, whereas the riders who are closer to 7 hours are typically burning up 500 KJs an hour. Keeping your Intensity Factor® (IF®) closer to .70 will benefit most age groupers. The rider who rode 7:22 was close to .80 IF, which is probably harder than he should have ridden. In order to have a successful race at Lake Placid, learning how to ride the correct wattage / HR and RPE is critical. You have plenty of time to implement steady rides of .68-.72 IF, and if you can, start out easier and ride the second half stronger than you did the first half. 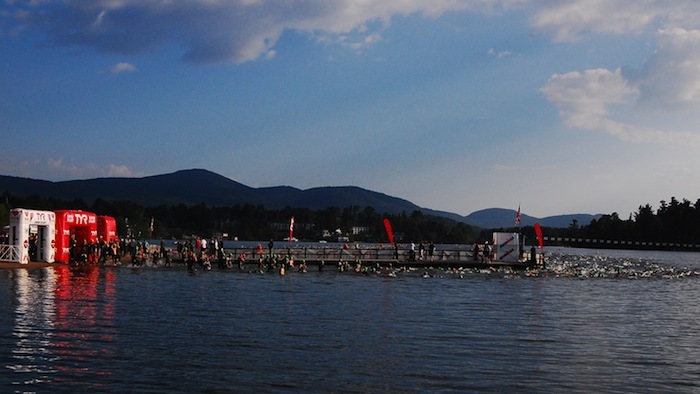 At IMLP you can expect a 10-20 minute increase on the second lap due to the wind and fatigue. If you can ride an even or negative split, even better. I would recommend a few long rides, 150-180k, like this before race day. Another quality workout you’ll want to execute each week, is doing 3-5×10 minutes in the big ring, to build up strength for the hills of Placid. This is a very challenging run due to the downhill start and the long climb back to town. Like the bike, this is two loops. I recommend you start out slowly and build the effort on race day. Once you hit the lower and rolling parts of the back end of the course, you’ll lose that downhill advantage and if you took the start too hard, you’ll pay for it. The climb back to town can be a slugfest, but if you can hold back in the early miles, you’ll have plenty of energy left. The crowds can be a huge advantage, but don’t let them psyche you up too much – you’ll want to save the adrenaline for the second lap. With 8 weeks to go, you have time for a few more long runs and if you can find some long downhills and uphills in your area, that’s going to benefit you on race day even more. You don’t have to run the hills hard, but it will help you get familiar to the long downhills and uphills. Another great workout to try is short hill repeats of 2 minutes (build up to 9-10). This will help your run form, and your strength overall for the last miles of the Placid run course. I would keep the long run to around 2:45, as there isn’t much physiological benefit for running longer. Lake Placid is a tough race, and you have to be mentally prepared for the wind on the second half of the bike, along with the hills. On the run, you have to be strong on the second half of the run in order to finish strong. Having a nutrition and pacing plan in place prior to this race is going to help you reach the realistic goals that you’ve set. Good luck.